AMITABH BACHCHAN: In the New Year, the entire family is hoping to do the kind of work that would please the audience and carry the company forward. Our New Year wishes? May 2010 bring peace and well-being. May it fill us with pride as a nation. May our glory spread further. May we progress in all walks of life. And may the year keep me alive to witness the country, the film industry and my family prosper and progress. I look forward to the coming year passing peacefully. KATRINA KAIF: I couldn’t hope for a better New Year’s day. I’m in London with my sisters and brother having the time of my life. We have lots of fun when we all are together. After I started working I have hardly seen my siblings. So meeting them is always special and a festival to mark our meeting, is the cherry on the cake. My mother forced me to leave my cell phone behind in Mumbai, so I’m almost cut off from Bollywood. What hopes for 2010? Lots of hard work and hopefully hits. SHAH RUKH KHAN: I will be at home (Mannat) with Gauri, Aryan, Suhana and a couple of close friends like Karan Johar. Being with close family is the one thing I truly cherish. AKSHAY KUMAR: Tina, Aarav and I are in Goa. I normally take a vacation from December 29 to January 2 because it includes a double celebration. Tina’s birthday on December 29, and then the New Year’s eve party. Honestly what can be better than spending time with your loved ones? This is a commitment I have made to my family. DEEPIKA PADUKONE: I will be home in Bangalore with my parents and my sister. Then I go to Goa to wrap up the last fortnight on Ashutosh Gowarikar’s film. Every year I hope that the following year is as exciting as the previous year and I’m very happy with the way my professional life is going. Hope 2010 is the same. RANBIR KAPOOR: I start shooting for Siddharth Anand’s film in the US from January 2. Since I didn’t wish to be in an aircraft on New Year’s eve, I left India on December 27. My entire family is in Dubai as tomorrow is my paternal grandmother’s birthday and the family is treating her to a one-week holiday there. I wish I could join them! KAREENA KAPOOR: Saif and I are in England. We are catching up with Saif ’s Oxford batchmates and their spouses. I’m dying to wear my fur coat and sniff the English chill… looking and feeling every inch a diva. We work hard all the year around to make this happen, so let me enjoy myself. BIPASHA BASU: I’m performing tonight. Then there will be a small get-together with friends. I always like to keep my New Year’s plans uncluttered. Home is the best place to be on any special occasion. And New Year will be a nonfilmy evening at home. Beyond that my only resolution for 2010 is, love yourself. VIDYA BALAN: I bring in 2010 with my birthday tomorrow… no one can forget it! What hopes do I have for 2010? Oh plenty! After watching Mr Bachchan at work in Paa, I realised being focussed on your work to the point of shutting out everything else is not something I need feel guilty about. Now I’m all set to be seen as this full-blown, seductive, sexually-charged woman in Ishqiya. It brings an entirely new perspective to my personality for the audience. That’s what I’m hoping for in 2010… to find new aspects to my personality through the roles I play. AJAY DEVGN: Kajol, Nysa, my parents, cousins, sister and her family and I will all be at our Karjat farm house. We’re planning an extended holiday. I start work only from January 2, so does Kajol. So in the meantime it is going to be a huge, long party. AMRITA RAO: I wonder what 2010 has in store for me… Resolutions sound nice to the ears but adhering to them is a matter of destiny! AMISHA PATEL: I have a show in Dubai. I will be working and then I will take a holiday. I always like working on New Year’s day because I feel you will then be working throughout! RITESH DESHMUKH: Friends and I are contemplating how to ring in the New Year. It’s not compulsory to indulge in anything fancy, even a quiet time with good friends does the trick! ARSHAD WARSI: I am looking forward to three releases in 2010. Will start Raju’s film next year so it’s going to be an eventful year. I haven’t a plan for New Year as yet. I’ll be with family and friends. ANUSHKA SHARMA: I don’t do much for the New Year. Actually I do nothing. I just wish my family and go to bed. SHABANA AZMI: As usual I’ll be with my family and a few close friends for the New Year. IRRFAN KHAN: On every festive occasion I try to visit my mother in Jaipur. But for the New Year I made plans to be home. Beyond the New Year I’ve made no plans. I’ve noticed every time I’ve chalked out a plan for myself, life has humbled me. I leave all my plans to God. HEMA MALINI: I won’t be doing anything much for New Year. I’ll be with my family and rehearsing for my dance show which is on January 2. POOJA BEDI: I’m having a small get-together on the terrace of my beachfront penthouse with flowers, candles and an incredible view of the entire city, with my father, my children and a few loved ones. SUSHMITA SEN: I normally travel overseas. However, Alisah, my younger daughter, can’t travel abroad yet because she doesn’t have a passport. Hence it will have to be a beach resort in India. ASIN: For me it will be a quiet New Year with family. I wanted to make it for Christmas itself, however I will ring in the New Year at my family home in Kerala. SIX HINDI FILMS THIS FRIDAY! There would be no biggies for the next four weeks. The Ramzan month has commenced, during which a sizeable chunk of audience stay away from the theatres. Taking advantage of this, every year, a number of small and medium budget films hit the theatres in this holy month. The producers of such films hope that their film would do a good business in the absence of any biggie. Last year, ‘A Wednesday!’, 1920 and Welcome To Sajjanpur released during Ramzan and became hits. And this year too, lots of small-budget films are all set to hit the screens. These films failed to get a proper release before the Ramzan as all weeks were booked by the biggies, owing to the producer’s strike which happened in summer. And this has resulted in a chaotic situation as around 20 films are planning to release in this month! 2 of them released last Friday-Shadow and Sikandar. In fact, tomorrow, as many as 6 films are all set to hit the theatres. These films are Daddy Cool, Kisaan, Quick Gun Murugun, Toss, Yeh Mera India and Love Khichdi! Any layman can understand that it is indeed foolish for 6 films to release on a single day. And we should not forget the 2 Hollywood films that are also releasing tomorrow- Race To Witch Mountain and The Taking of Pelham 123. So this takes the number of films arriving tomorrow to 8! Madness! But if observed, then producers don’t have much of a choice. If they won’t release their films now, then they won’t be able to do so till the end of 2009. Once the month of Ramzan ends, biggies will start releasing week after week. And releasing a small budget film with a biggie can be suicidal. So, they prefer releasing it with half-a-dozen other small films. Still, I fail to understand why only two films released last week and 6 films are releasing this Friday. What I mean is-2 of the films releasing tomorrow could have instead released last week. This would have made the situation less chaotic. Out of these 6, Quick Gun Murugan surely has an edge over the others. It is a spoof of western cowboy and Rajanikant films and its promos have been impressive. The film is releasing in 4 languages-English, Hindi and Tamil and Telegu. Kisaan (*Sohail Khan, Arbaaz Khan, Jackie Shroff, Dia Mirza, Nauheed Cyrusi and Rahul Dev) has the ability to do a great job in the North. Daddy Cool doesn’t have much chance. It is an official remake of the popular Hollywood film Death At a Funeral and is backed by Big Pictures. There are hardly any promos on TV which show as to what the film is actually about. Toss is the popular Ranvijay’s debut film, Yeh Mera India looks hard hitting while Love Khichdi’s promos started just a week ago! 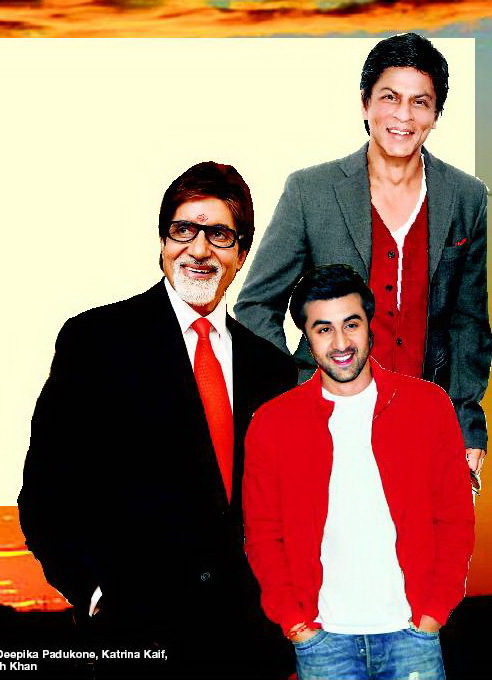 But these three films have dim chances of succeeding in this rat race due to no hype. There’s a possibility that the next two weeks will also see 4/5/6 films releasing. God save all these films! DHAN TE NAN IS NOT ORIGINAL! The song which has taken the entire nation by storm, Kaminey’s Dhan Te Nan is not an original song! Yes, you read it right! It was used around a decade back in Gubbare, a popular serial at that time on Zee TV comprising of short comedy stories. But before you blame composer Vishal Bharadwaj of being Pritam-2, here’s the entire truth-Vishal Bharadwaj himself had composted the Gubbare’s Dhan Te Nan! In fact, he was also the director of the episode in which the song is played. And even the lyricist for both the songs is the same (Gulzar)! Although Bharadwaj did some changes in Kaminey’s Dhan Te Nan, there are many similarities in both of these versions. Even the line ‘Teli ka tel’ was incorporated in the original song. I wonder, why no one’s sentiments were hurt at that time?! Anyways, I’ve uploaded the original below. Do watch it and have a laugh! DO NOT MISS IT! P.S. : The actor in red coloured shirt…is he Sharman Joshi?